I hope you all had a great weekend! I'm back from NYC and so, so thankful for the unbelievable experience I had there. I met so many beautiful people and made the best memories. Although I was only there for three days, I am beyond tired! I've always heard other bloggers say how badly your feet hurt after the first couple of days and man, were they right! Constantly changing clothes and running around the city in 4 inch heels make for long, busy days, but I wouldn't trade them for anything. Since this was my first time going, I was a little nervous to attend, but I'm so, so glad I did. I learned so much and made so many great connections with brands, designers and other girls in the blogging world. I'm already looking forward to Fall Fashion Week and will definitely have a better idea of what to expect. Thank you all so much for all of your sweet + encouraging comments while I was preparing to leave and while I was in NYC. Some girls get a bad reputation for attending Fashion Week while being such a little fish in a big pond, but we're all there for one reason - following our passion and love for all things fashion. I feel so lucky to have met so many beautiful friends through blogging and feel so blessed to be able to attend something as amazing as Fashion Week. You guys are the best - thanks for being so lovely. I love this look! Absolutely stunning! I love this! 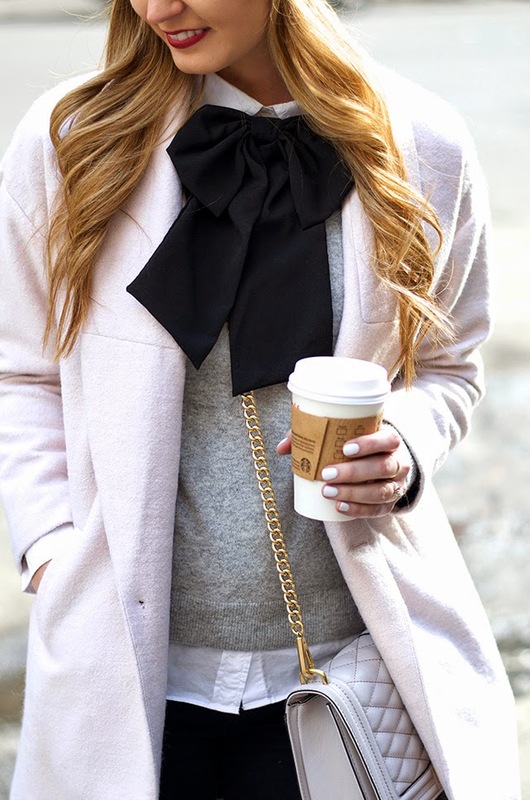 The detail of the bow at the neck adds so much to the outfit and your legs look so long with all black pants and booties. Love it! Such a cute look. Loving the bow!! I love how the black from the bow brings the look together! I love everything about this outfit! Especially the bow. Adorable! Good for you for taking a risk and going. The blogging world can be really scary sometimes. I have yet to do what you just did, so props. Any advice you have about how to even get started with attending fashion week would be greatly appreciated! Well said! I hope that one day my style blogging journey leads me to fashion week! PS - love those jeans! I saw this on Instagram and loved it! I need a good bow like that, so adorable! Ah so glad you got to see fashion week! The best way to assimilate into the culture is to go and experience it yourself! You look super cute btw!